If a new phone is top of your Christmas list, or you have recently upgraded/treated yourself to a new phone (*raises hand*) then one of the second thoughts you have after ‘Ooooh portrait mode is the one’ is I should probably really look after this one. 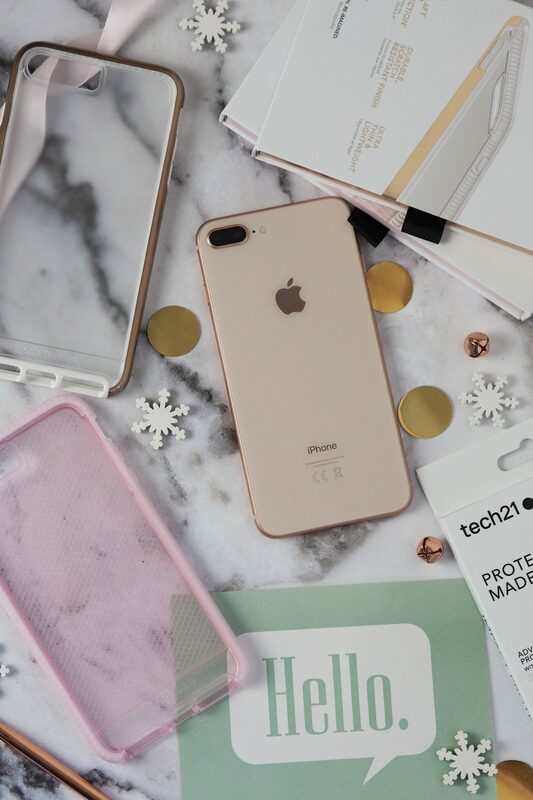 Which is why getting a decent case is top of the list – plus makes a great little stocking filler if you’re looking for one for a gadget-obsessed friend. I’ve made the mistake before of either buying a cheap case or a novelty one. They might look fine, but you know what – when you drop your phone and it smashes even when in a case… you’re going to wish you didn’t. I’ve definitely learnt my lesson and make sure my phone has a decent impact-resistant case AND a screen protector on before I take it out and about. Which is obviously better at protection AND looks better than the sock I was carrying my iPhone8 Plus around in for a few days before I got a case sorted! I know, not even kidding. I have a couple of cases now from tech21’s iPhone 8 Plus case selection and I wanted to tell you a bit about them so if you’re looking for one yourself you know what to expect. I have an Evo Elite in Polished Rose Gold. 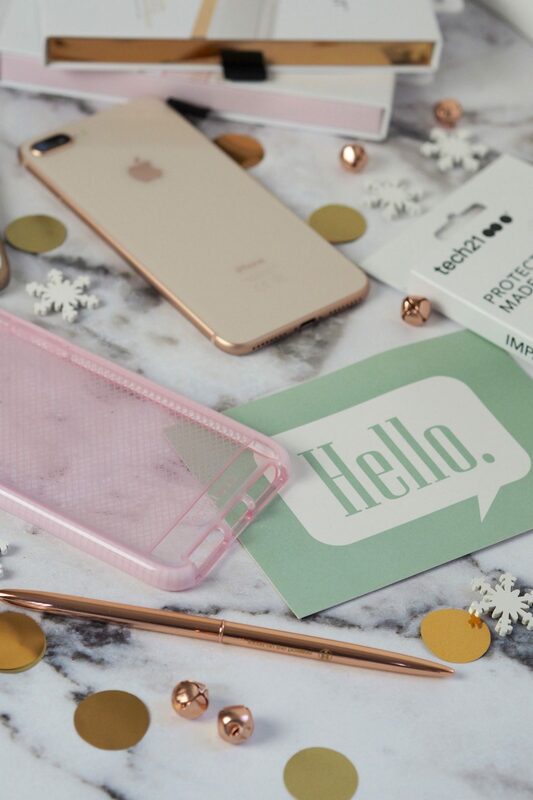 This case has a transparent back and rose gold bumper with white ‘lip’ over the front – to help protect the more delicate screen side of the phone. 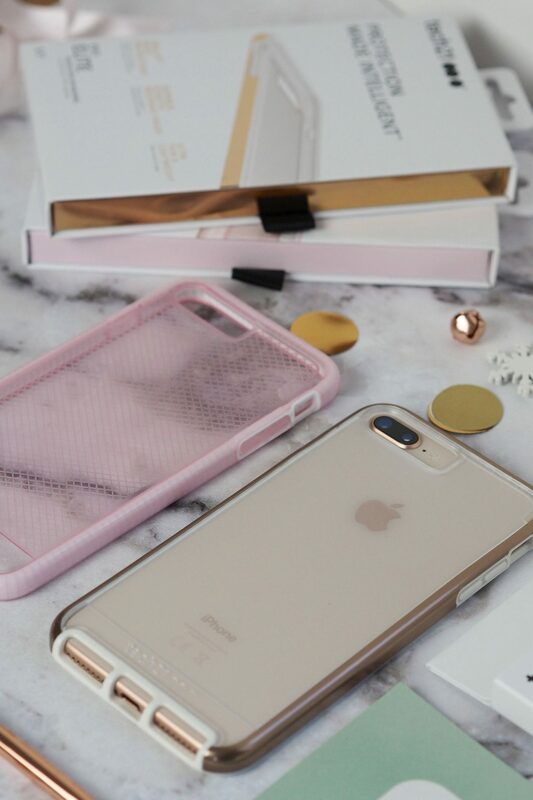 The white bumper means the case looks subtle from the front and the rose gold bumper blends with the colour of the phone. The phone easily inserts but feels secure once in and it doesn’t feel too bulky to hold – of course it does feel a little bulkier than the phone without a case. But this is normal and to be expected if you want to keep it safe from drops and knocks. The tech21 Evo Elite protects your phone from 2m of drop – which is pretty good considering last time I broke my phone screen it was from knee-hight… and yes I had a cheap case on it not a decent one! The other case I have is the Evo Check in Rose Tint & White. A similar style but more rubberised overall and with a check texture/pattern to the transparent back. It’s a baby pink shade all over with the bumper being a more opaque shade. If you prefer a rubberised feeling case then the Evo Check is a good option. The Evo Elite is a more ‘solid’ feeling case. So it’s essentially down to what you prefer in terms of look and feel. 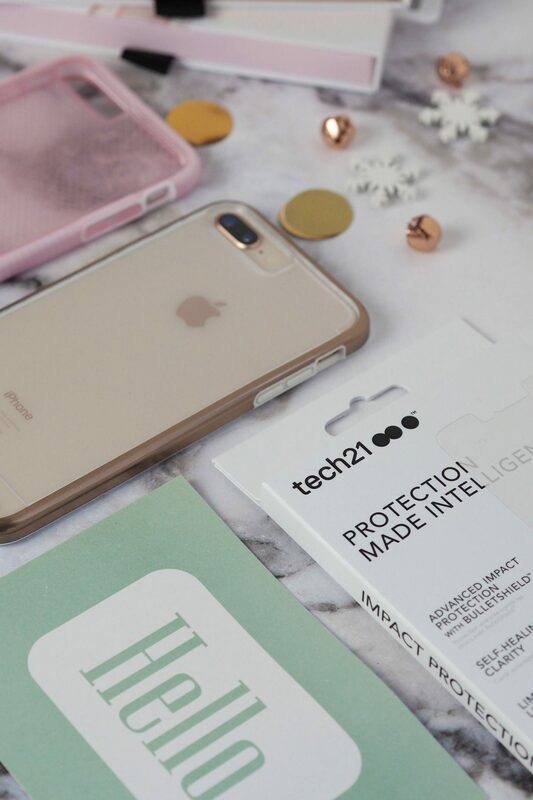 Either way it’s definitely worth not skipping the screen protection and adding the tech21 Impact Shield Self Heal screen protection to avoid the frustration of a smashed screen. I should add here it’s not just iPhone models they do cases for – they have cover options for a huge selection of both phones, laptops and tablets. Including the snazzy iPhoneX – so I’ve been badgering Ollie to get a case because he recently upgraded to this and he’s not so great at keeping his safe from drops and knocks….! I have TWO cases to give away – to fit the phone model of your choice. Just head over to my instagram to find out how to enter. There are two up for grabs so you can get one for you and one for your most-messaged mate.